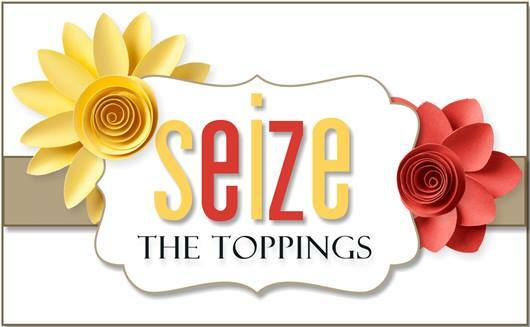 Hello Friends, We have a fun topping starting today over at Seize the Birthday and that is to use Vellum on your card and or project! Easy huh? I first want to clarify that this card was not my original idea! 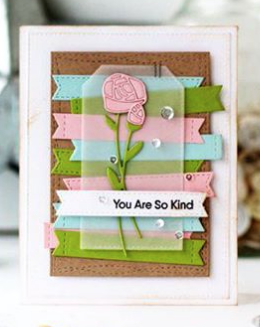 Below is the GORGEOUS card I CASED! I can’t find the original post! I know it’s from someone I follow regularly. Looks like a Laurie Schmidlin card from Just Give Me Stamps if you ask me, but I can’t be certain! Heavy sigh! Any hoozal…life must go on! 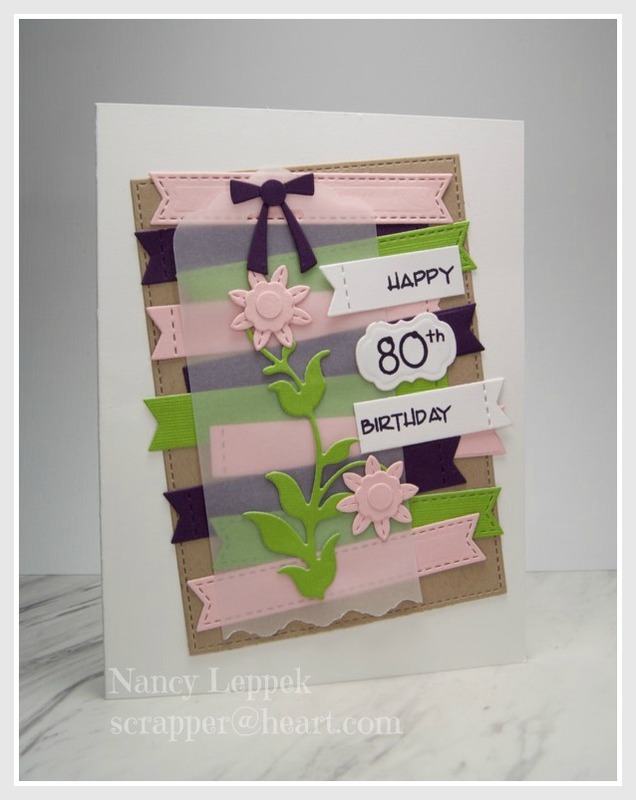 My card is for a dear friend of mine that is turning 80 very soon. The stitched rectangle, banner dies, flowers, and floral leaf are all from MFT. The bow is from Paper Smooches and the vellum tag was cut with my SU tag punch and scalloped with my Fiskars victorian blade. The Happy Birthday that I divided is from Verve. Such a quick and fun card to put together. I think before I stick it in the mail it needs some bling! Categories: cardmaking | Tags: Card making, Cards, Happy Birthday, my favorite things, rubber stamps, stamping, Verve Stamps | Permalink. Your card is so beautiful. I love the colors and all the layers. Beautiful card. Love the colors and the vellum tag. This is so cool! Love all of the die cut pieces and the vellum tag is perfect! Sp many die cuts and so many layers, and still so beautiful! Fantastic card, Nancy! Oh I love this idea Nancy, layering up all those banners as you did! Both versions are fabulous and I love the overlay of the vellum tag. Pinning this for future CAS-ing! I didn’t know that pink, green and kraft could make such a gorgeous combo! Super sweet layout! This is such an interesting design. I really like it, and the colors are great! Beautiful card! Love the vellum underneath the beautiful design! Beautiful card! Have a Blessed day! Absolutely gorgeous!! I love the fun dies! !